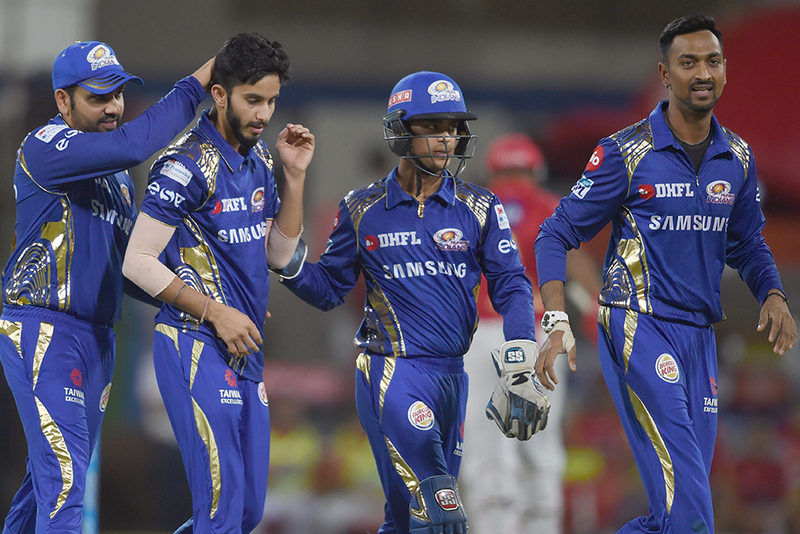 Mumbai: Defending champions Mumbai Indians will look to make the most of their morale-boosting victory over Kings XI Punjab and continue their resurgence when they lock horns with Kolkata Knight Riders in an Indian Premier League (IPL) clash at the Wankhede Stadium on Sunday. Mumbai recorded a thrilling win over Punjab on Friday night in a tie they had to win to keep alive their slim chances of making the play-offs. The victory lifted Mumbai to fifth in the points table but thanks to a spate of reverses over the past few weeks, the Rohit Sharma-led side still have a stiff mountain to climb. The 21-ball 56-run blitzkrieg between Krunal Pandya and Rohit Sharma in Indore helped MI turn the tables on more fancied Punjab, who are now placed fourth. The hosts have to win all their remaining five games to make it to the play-offs. In KKR, they will find a rival who have more often than not got the better of them. Suryakumar Yadav (340 runs) has been in great form for MI and has scored consistently. But his opening partner, West Indian Evin Lewis has disappointed and will need to step up against KKR whose spin trio of Kuldeep Yadav, Piyush Chawla and Sunil Narine can be very dangerous. Skipper Rohit, who struggled to get going initially, has found some sort of form and now will have to lead from the front. KKR are sitting comfortably in the third position and Dinesh Karthik’s side will be full of confidence coming into the game after registering a facile victory against the mighty Chennai Super Kings at the Eden Gardens. An area where MI need to improve is their bowling in the death overs. The likes of New Zealander Mitchell McClenaghan Hardik Pandya, who leaked over 20 runs in the final over against Punjab, have failed to keep it tight. Jasprit Bumrah, Ben Cutting and young leggie Mayank Markande (12 wickets) also have to buck up if KKR’s strong batting line-up is to be tamed. For KKR, the batting has looked steady with Karthik scoring 280 runs in nine matches followed by Chris Lynn and Andre Russell, with 260 and 207 runs respectively. The firepower of Narine at the top and the emergence of youngster Shubhman Gill in the middle order adds teeth to their batting. KKR will hope to welcome back in-form Nitish Rana, who was suffering from a back spasm and missed the last game. KKR pacers Tom Curran, veteran Mitchell Johnson and rookie Shivam Mavi need to step up and deliver. Meanwhile, Kings XI Punjab will aim to bounce back to their winning ways when they take on bottom-placed Rajasthan Royals at the Holkar Cricket Stadium. While Punjab are placed fourth with five wins and three defeats and 10 points, the Ajinkya Rahane-led Rajasthan languishes at the bottom of the league points-table with just three wins from eight games. With just six points in their kitty, Rajasthan are in a must-win situation with the league just about past the midway point. Although both teams have suffered two straight defeats each, Punjab have a better chance to book a play-off berth. Punjab’s batting mostly relies on opener Chris Gayle, who has accumulated 302 runs from just five games, averaging 100.66. Even in their last encounter against Mumbai Indians on Friday, when most of the Punjab batters failed to go big, the self-proclaimed ‘Universe Boss’ slammed a 40-ball 50, laced with six boundaries and couple of sixes. In-form opener Lokesh Rahul, who faltered in the game against Mumbai, has been in good form, amassing 292 runs from eight games. The Punjab openers have been a major reason behind their success as the duo have handed a perfect start to their side on several occasions in this year’s edition. Karun Nair has also been impressive after 209 runs from seven innings but veteran Yuvraj Singh, Aaron Finch and Mayank Agarwal are yet to make their presence felt in the middle-order. The trio’s poor form could be a cause of concern for the team management and this is high time for them to come out with their best. In the bowling department, skipper Ravichandran Ashwin, along with medium-pacer Mohit Sharma add depth to the line-up. Also, pacers Barinder Sran and Andrew Tye, and Afghan spinner Mujeeb ur Rahman shoulder the bulk of the responsibility. While Australian Tye has 10 wickets from eight games with an economy of 7.90, pacer Ankit Rajpoot and Mujeeb Ur Rahman have seven and nine wickets each. On the other hand, Rajasthan Royals have experienced a topsy-turvy campaign so far. With the IPL entering its business end, skipper Rahane will expect his team to get their act together and aim for consistency. In their previous match, Rajasthan fell short against Delhi Daredevils by just four runs in a rain-affected tie. Among the bowlers, young seamer Jofra Archer have done well to claim seven wickets from just three matches while this IPL’s costliest buy Jaydev Unadkat have also been among the wickets. Rajasthan’s main concern will be the form of their spinners — Shreyas Gopal and K. Gowtham — who have so far failed to hunt as a pair. While Gopal has six wickets from seven games, Gowtham has bagged five wickets from eight matches. Rajasthan couldn’t afford another defeat from here as it would almost crush their dream of a play-off berth.